Vinegar is inexpensive, safe and 100 percent natural, and nearly every household has a bottle tucked away somewhere, but few people ever take advantage of its full potential. Yes, it's great for dying Easter eggs and making salad dressing, but there's so much more it can do. In Vim & Vinegar, Melodie Moore tells all. Here are hundreds of tips to help readers tenderize meats, soup up soups, eradicate odor, firm fish fillets, cut grease, ease arthritis, cure cramps and more. Versatile vinegar also does wonders for flavoring food (plus, it has no fat or calories), and readers will be amazed at the range of tasty recipes, which include such treats as Vinegar Pie, Crazy Cake and Vinegar Hard Candy. 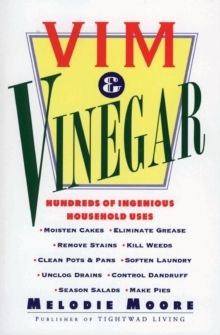 For tightwads, environmental activists, health advocates and curious cooks -- in fact, anyone who appreciates good old American ingenuity -- Vim & Vinegar is the perfect book.